Ryan Reynolds returns in the title role of Wade Wilson, aka Deadpool, in "Deadpool 2," a bleak and wrenching psychodrama that's sure to confuse and infuriate fans of the original. The first "Deadpool," directed by Tim Miller, was distinguished by its three-jokes-a-minute pacing and its reluctance to take the usual superhero origin cliches seriously. This film from stuntman turned director David Leitch (who debuted behind the camera with "John Wick") starts with a literal bang, with our mysteriously depressed hero immolating himself atop a deathbed of explosive fuel canisters, then works its way backwards to detail the trauma that made him sad enough to kill himself. Frankly, I was stunned that Leitch, Reynolds and company had the nerve to kill off such a bankable wiseacre in the first five minutes of their film, then devote the rest of their running time to supporting characters' attempts to grieve and move on with their lives, their struggles captured in bleached-out images more commonly associated with DC movies. The emotional peak is a long sequence of Wade's widow Vanessa (Morena Baccarin) taking the hero's now-useless red uniform down from a hanger in the closet, inhaling her late partner's scent, and bursting into tears while the soundtrack plays a minor key a cappella version of Boston's "More Than a Feeling." OK, obviously none of that happens, except for Wade blowing himself up—and if you've ever read a comic book in your life, or seen a movie, or drawn breath, you know that a superhero film doesn't start with the hero offing himself unless it plans to undo the damage as soon as possible. "After surviving a near fatal bovine attack, a disfigured cafeteria chef (Wade Wilson) struggles to fulfill his dream of becoming Mayberry’s hottest bartender while also learning to cope with his lost sense of taste." That's how 20th Century Fox's official website summarized the plot of this movie when it first came out, which should give you some small indication of the level of sobriety the filmmakers have brought to this venture. Even when "Deadpool 2" is being serious, or trying to fool you into thinking it's being serious, there's a gleam in its eye that gives the game away. The script, credited to Reynolds, Rhett Reese and Paul Wernick, finds the mutant Deadpool meandering his way to the X-Mansion and joining various X-Men members—including Domino (Zazie Beetz) and Colossus (computer effects plus the voice of Stefan Kapičić)—as they try to protect an alienated, rebellious teen mutant called Firefist (Julian Dennison) from assassination by the Terminator, er Looper, er mercenary-from-the-future Matthew Cable (Josh Brolin, aka Young Nick Nolte Returned, playing his second Marvel character in less than a month). There are striking similarities between certain, um, elements in this film and "Avengers: Infinity War"—a fluke of timing, surely; the movies don't even share a studio (yet). Among them: a thorough working-out of the old, mostly rhetorical comic book question, "How dead is dead?" "Deadpool 2" treats the topic about as thoughtfully as it can, without ever, for one millisecond, seeming as if it might look real suffering in the eye. 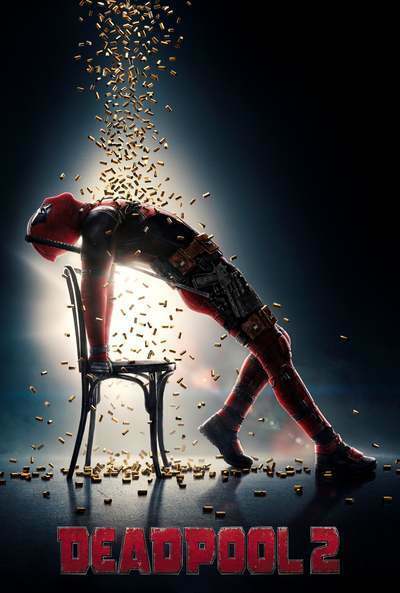 As in the first "Deadpool," the backbone of which was an unexpected cancer diagnosis, Wade and other characters suffer loss and disappointment, but nothing that can't be fixed or amended through machinations that are already implicitly promised in the hero's opening narration. There's some unpleasantness, but the cheeky dialogue and cheerfully cynical voice-over ensure that we'll never have to marinate in it. It's just not that kind of film. More so than any other superhero movie, including the original "Deadpool," this one is the R-rated comics equivalent of one of those knowingly featherweight Bob Hope and Bing Crosby "Road" movies (for a full list, click here), in which Hope and Crosby's fast-talking vagabonds wriggled out of tight spots through sheer shamelessness and verbosity, pausing to break the fourth wall and tell the viewer that now might be a good time to go out for popcorn. The result feels a bit like a lavishly produced, superhero- and supervillain-stocked standup comedy special, with fight scenes, chases and explosions spliced into footage of the hero telling you about the wild couple of weeks he just had. Reynolds repeats the original "Deadpool" dynamic of giving the movie at least five times what it gives him in return, turning neediness, self-pity, desperation and narcissism into different kinds of comic fuel. There are constant acknowledgements that you're watching a movie, and a formulaic one at that (right before the the start of the film's third act, our boy declares that if his plan succeeds, everybody gets to go home early because there'll be no need for a third act). There are seemingly random (but not really) pop culture references, including a comparison of the melodies of "Do You Want to Build a Snowman" from "Frozen" and "Papa, Can You Hear Me?" from "Yentl." There's shtick galore, including quite a bit of slapstick with a body count, plus some retroactive criticism of the Marvel brand's attempts to be capital-I Important ("We're the X-Men, a dated metaphor for racism in the '60s!" Deadpool declares, right before a big setpiece). There's even a protracted bit of mugging near the end that's reminiscent of early Jim Carrey. And there's something to be said for a film that knows what it is, and is serenely content to be that thing. Except for a few individual lines and sight gags, a brilliantly over-the-top action-comedy sequence near the midsection, and some characteristically sharp performances (including the one by Brolin, who imbues what might've otherwise been a granite-jawed killer meathead with recognizable humanity) there's not much to fondly recall here. But since "Deadpool 2" shows no sign of wanting to rewrite a whole genre with its audacity, we might as well concede that it does the job it apparently wants to do with professionalism and flair, and that the faster we end this piece, the faster you can go on social media and complain about it.